The undulating surface shape of the Wave Mirror creates an interesting 3-dimensional interplay of shadows between light and dark on the frame. The clear mirror inset surface is highlighted by a 1" wide bevel on all 4 sides. Woods typically used in the creation of the Wave Mirror are typically FSC certified as being derived from sustainable sources. 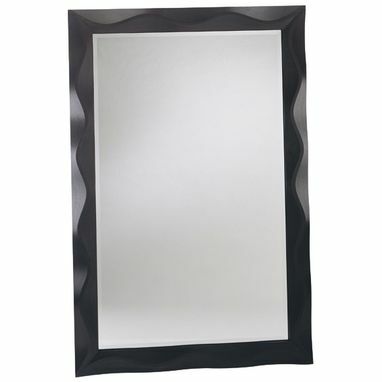 The specifications of the Wave Mirror are also consistent with the sustainability standards set out by the U.S. Green Building Council's stringent LEED (Leadership in Energy and Environmental Design) program, namely the MR-7 Credit for certified wood use; the EQ Credit 4.1 for Low Emitting Solvents and Materials; and the EQ Credit 4.2 for Low Emitting Materials, Paints and Coatings.